History: 50 year old female with melanoma. 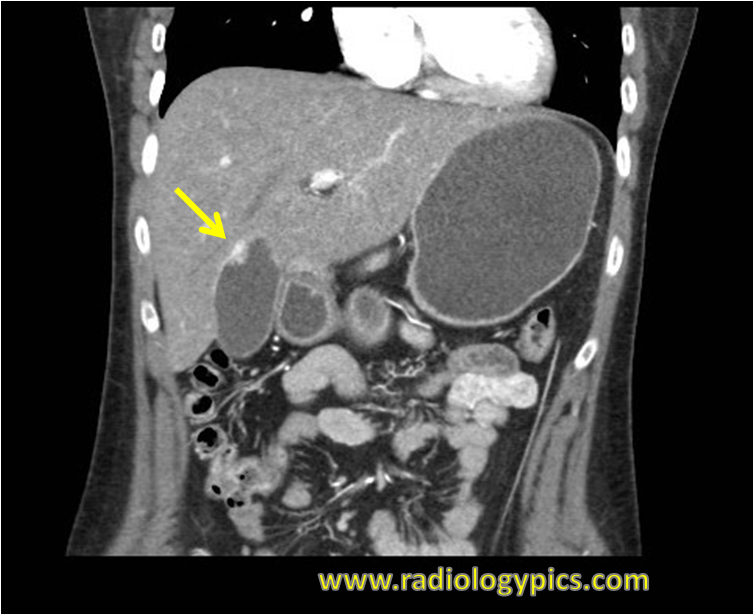 Gallbladder Metastases of Melanoma – Coronal CT of the abdomen with contrast reveals an enhancing soft tissue nodule along the wall of the gallbladder compatible with melanoma metastases. This is a case of metastatic malignant melanoma to the gallbladder. Melanoma is the most common cancer to metastasize to the gallbladder, and it usually occurs in the setting of widespread metastatic disease. Melanoma metastases are usually hyperenhancing. The differential diagnosis in this case would include other causes of gallbladder wall thickening. These include benign gallbladder polyps, adenomyomatosis, polypoid gallbladder carcinoma, and possibly tumefactive sludge. Treatment for solitary gallbladder metastasis of melanoma is surgical excision; however, these patients have a poor prognosis. As a 50 year old female I had Metastatic Melanoma of the gallbladder totally missed in Tasmania Australia, referred to as sludge despite it consuming most of my gallbladder. An ultrasound that was done 5 weeks later after my persistence as it was not consider urgent by my GP. this was to confer with CT scan it was just sludge. Emergency surgery was required upon presentation to the ED with severe gallbladder pain after eating avocado dip, 3rd time, this time my bloods were out and apparently it is practice to remove gallbladder if presented 3 times for upper abdominal pain? Removal of my gallbladder revealed a large polypoid metastatic melanoma tumour so large it was growing through the biliary duct. It has been 3.5 years with no other treatment but prognosis is poor for stage iv Metastatic melanoma patients. It is sad that for two years previously I complained both to my GP and presented to the ED with severe gallbladder pain but because my bloods were not out it was put down to anxiety. Better tests need to be devised so other people like myself are not living in the shadow of death.